During the next eight days, independent U.S. oil explorers are expected to report 2015 losses totaling almost $14 billion, the result of the steepest price collapse in a generation. Hess Corp. kicks off earnings season for the companies on Wednesday with what analysts predict will be an annual loss of $1.6 billion, its worst performance in at least 28 years. It will be followed by peers including Murphy Oil Corp. and Anadarko Petroleum Corp., which also have been squeezed by a crude drop of more than 70 percent since June 2014. “It’s not going to be pretty,” said Carl Larry, head of oil and gas for Frost & Sullivan LP in Houston. 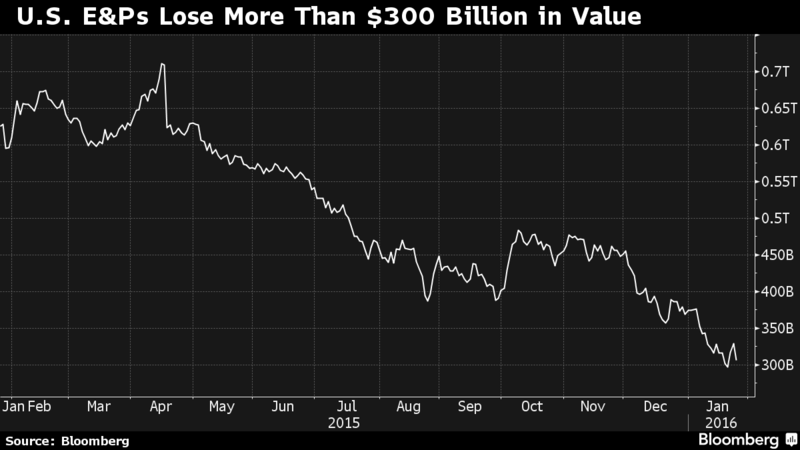 Investors have punished oil and gas explorers, wiping out more than $300 billion in market value for the companies in the Bloomberg Intelligence North America Independent E&Ps Valuation Peer Group in the past year. Distressed debt exchanges and bankruptcies are mounting. The companies have fired thousands of workers, abandoned drilling projects, cut dividends and restructured debt to conserve cash and fend off insolvency.